MONTREAL -- During a recent meeting of Montreal's police oversight body, Insp. 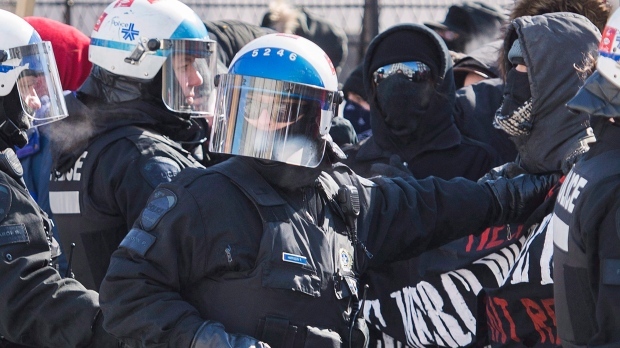 Pascal Richard made a shocking claim: city police officers dressed in civilian clothing and wearing masks would infiltrate protests pretending to be protesters. Richard was responding to a question from a young woman regarding a Dec. 8, 2015, protest where masked officers in civilian dress were reportedly aggressive with demonstrators and pushed some to the ground. "I know what incident the woman is talking about, and since Dec. 8, 2015, we no longer use this strategy during protests," Richard told the public security committee meeting. Richard didn't say how many years this practice was used, but the fact he said anything about it at all reflects a change in attitude following a series of high-profile scandals that have shaken the public's confidence in its police force. Alex Norris, chairman of the oversight committee, said he too was surprised by the revelation. "I heard allegations ... but I had never seen an acknowledgment before that these practices were actually in effect," he said in an interview Thursday. Norris is part of a new municipal government that has promised to make City Hall -- particularly its police force -- more transparent. Meetings of the oversight body are now open to members of the public, who can ask police questions directly. Nine such meetings have been held since Mayor Valerie Plante won the November 2017 election, Norris said, adding that before Plante, public meetings on policing were the exception, rather than the rule. Problems in the city's police force surfaced in 2016 when it was revealed police electronically surveilled the telephones of several journalists in order to catch sources of embarrassing leaks to the media. The Quebec government ordered a public inquiry, which resulted in a new law protecting journalists' sources. In February 2017, two retired officers alleged members of the police's internal investigations department embellish or fabricate evidence against lower-ranking officers who fall out of favour. Spurious investigations were allegedly launched to obtain phone records and other surveillance warrants in order to intimidate colleagues, they claimed. In response to the allegations, the Quebec government mandated a former deputy justice minister to investigate. Michel Bouchard's report, released in November 2017, was damming. He wrote about a "climate of tension and suspicion" in the force and noted officers testified how colleagues were investigated based on unjustified, biased evidence, or as a result of a personal grievance or act of revenge. "We believe there has been a weak culture of public oversight of the police for a long time and that's why we've experience (these) kinds of problems," Norris said. Bouchard's "general findings were devastating to the credibility of the internal affairs division." As a result of the scandals, the city's police chief, Philippe Pichet, was suspended, and ultimately lost his job. The province installed Martin Prud'homme, chief of the provincial police, to temporarily take over from Pichet and initiate reforms. Denis Barrette, lawyer and spokesman for Quebec's civil liberties advocacy group, attended the most recent public security meeting at City Hall and said the Plante administration's transparency policy is a good first step. "We'll see where it goes, it's a very good policy," he said. "Police corps are generally very opaque. They don't have an open culture and need to work harder to have more transparency." Despite its problems, Norris insists Montreal's police force has integrity. "We have always been talking about a minority of officers," he said. "The (Montreal police) has a proud 175-year-long history and has accomplished many great things. Montrealers and visitors to the city can of course have confidence in the protection that is offered by the police."